The two markets are very close to one another, in fact if you take a minivan to go to Amphawa, it will be the same minivan that also goes to Damnoen Saduak. There are multiple reasons why the Amphawa floating market is preferable to Damnoen. Let’s start by saying that Amphawa is much less touristy, and you can taste the energy of a true Thai floating market mainly visited by locals. This characteristic has a few strong advantages; for example prices are lower, with a tour on the famous “long tail” bots costing 50 THB a person. Besides this, if you want to buy something from one of the various boats that will approach yours, in Damnoen Saduak be ready to pay a high price by Thai standards, which doesn’t reflect the value of what you’re buying, whether its a fruit or souvenir. In Amphawa you can take a tour (it usually lasts an hour) with a boat guided by a local that will let you see a glimpse of Thai life that you rarely see in other places. Amphawa’s restaurants are well known for their excellent grilled fish. Eating crustaceans aboard one of the wooden boats docked near the restaurants or near the market’s central bridge is an activity enjoyed by both international tourists and locals alike. Since Thailand is Bangkok-centric, practically every corner of the country can be reached from the capital. From Bangkok you can get to Amphawa in about an hour and a half. Minivans that leave from Morchit cost about 80 THB a person, and will bring you directly in front of the main entrance of the market. When you take a minivan to go to Amphawa, pay attention to make sure to specify at the ticket counter that your stop is Amphawa and not Damnoen Saduak, since both destinations are reachable with the same minivan. The price is also slightly lower; since Amphawa is a little closer it has a lower price, while Damnoen Saduak costs 20 THB more a person. The departure point for the minivans has changed in the last few months of 2016. Though all minivans used to leave from the immense roundabout of Victory Monument, now they’ve been divided on the basis of the area they cover. Minivans headed to the northeast, for example leave from the Morchit station (north area of Bangkok), those going to the southeast, such as Pattaya, leave from Ekkamai station. Both stations can be reached by the Sky Train. Once you get to the main entrance you’ll be approached by a little Thai man in his sixties, who is always looking for new clients for his boat tours. I’ve been to the Amphawa market three times, and each time I saw this nice man come up as soon as the minivan leaves to go on to the Damnoen Saduak market. He’ll offer you a price of 100 THB a person for an hour. In this “classic” trip, he’ll bring you along the shores of the river where you can see (besides the entire floating market from a different perspective) Thai homes built on stilts. During the trip you’ll even see a few monasteries immersed in the tranquillity of the river, surrounded by a slice of authentic village life where there are locals taking a dip or washing their clothes in the river. If you’d rather personalize your trip, this man is willing to follow a different course (for a price that depends on what you choose) and even dock the boat to stop at the various Buddhist temples instead of the floating restaurants. Since it’s not too far form Bangkok, Amphawa can be reached by taxi for a relatively low price. Depending on your bargaining skills and the mood of the driver, you can get to the market for a price of 1,000-1,500 THB per car. Travel times are less than those with a minivan; you should be able to do it in barely an hour. In Amphawa you’ll find hotels for all budgets. There are various guest houses that face directly on the wooden pier, or luxury hotels spread out through the various streets of the town. A cool option is to spend a weekend in one of the various hotels along the river that are reachable only by boat. The most convenient rooms start at 700 THB, going up to luxury hotels at 11,000 THB a night. I would recommend that you rent a room in one of the guest houses located inside the market. This way at night, when the various restaurants and shops light up with many colored lights, you’ll have the chance to taste a truly evocative atmosphere. 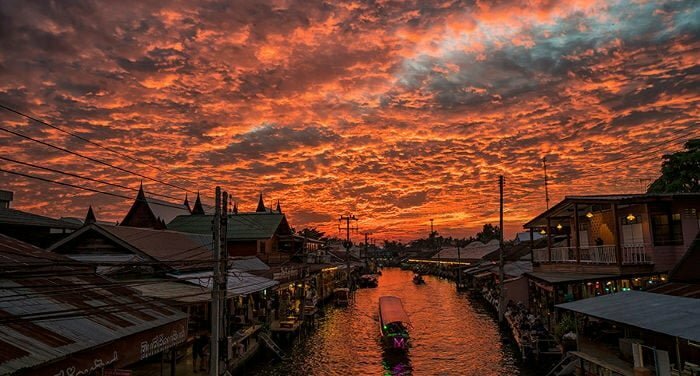 Amphawa allows you the chance to buy local products like handmade clothing, wooden objects, massage oils, and much more for good prices. Local restaurants are delicious, and you can eat fresh fish for reasonable prices right from one of the many boats, or sit and eat your meal inside one of the restaurants. As was mentioned previously, a way to not only explore the market but also the surrounding area is to take a boat. Besides the famous guy at the entrance of the market, if you take the central bridge (the cement one, just to be clear) and go left, you’ll find a bigger boat that will bring you through the rivers’ ways for 50 THB a person. Not far from the floating market there are also Buddhist temples: Wat Bang Kung and Wat Bangkae. These temples, like the market located on the railroad tracks, are two things you can do every day and not just on weekends like the floating market. Wat Bang Kung is about ten kilometers north of Amphawa, on the west part of the river. Its distinction is in the fact that over the centuries, a Bayan-style tree (like those in Cambodia, in the temples where Tomb Rider was filmed, with Angeline Jolie) has completely wrapped the temple in its enormous roots. In the VIII century, during the kingdom of Ayutthaya, Wat Bang Kung was a battlefield between Thai and Burmese soldiers. Due to its ancient history, this religious complex is also dedicated to teaching martial arts (Muay Thai in particular), besides being a recreation center for boy scouts. If you decide to go from Amphawa, Wat Bang Kung is reachable by taxi, tuk tuk, or by renting a boat. Wat Bankhae Noi hosts splendid wooden carvings inside. All decorations are handmade with different types of wood. Of particular beauty is the tree that rises up from behind the golden seated Buddha inside the temple. The Maeklong Railway Market (in Thai: ตลาดแม่กลอง) is a market that attracts thousands of tourists every year. Its distinction is in its location along the railroad tracks at Maeklong station. Eight times a day, when the train passes into the station, the local merchants (at the speed of light) take down then set up their wares. The market isn’t a big deal in and of itself, and as you can imagine the sanitary conditions are rather precarious. I strongly discourage you from buying food there like fresh fish or meat. Just before a train passes, there’s a loud signal so that tourists can move inside the areas left open for that purpose, so as to see the train pass by just centimeters from their noses. An alternative is to see the market directly by train. In this case you’ll have to leave from Wongwian Yai station (a small town located on the peripheries of Bangkok), with a train going toward Maha Chai. To get to Wongwian Yai station, unless you take a taxi, you can take the dark green line of the Sky Train, and get off at the Wongwian Yai stop. You should follow exit three and walk toward the stop called Somdet Phra Chao Tak Sin. In case you get disoriented, show the Thai writing to a local: ถนนสมเด็จพระเจ้าตากสิน. Turning left you’ll see a sign with the writing Somdet Phra Chao Tak Sin 2, and you’ll find yourself in front of the Wongwian Yai railway station. Another option is to take one of the many buses that leave from the middle of the city. Buses numbers 6, 10, 20, 21,34, 37, 68, 82, 85, 101, 105 and 120 all stop close to the train station. The first train leaves at 5:30 a.m., with the last one at 9:10 p.m. Once you get to Maha Chai station (a ticket costs 20 THB) you’ll have to take a boat (cost: 5 THB) that will bring you to the other part of the Tha Chin river, and take another train from Ban Laem station (in Thai: สถานีบ้านแหลม). The train that leaves from this station, in an hour, arrives at the final one in MaeKlong (in Thai: สถานีแม่กลอง). The trip lasts about an hour and a ticket costs 10 THB. Starting in 2017 the timetables for trains leaving for Maeklong have changed. The first train gets there at 8:30 a.m., there’s also one at 11.10, one at 2:30 p.m., and the last at 5:40 p.m. Trains departures are fixed at 6:20, 9:00, 11:30 and the last at 3:30 p.m. If you want to go to Amphawa from the train market, or wish to do the inverse tour and want to see Amphawa first then go to the railway market, all you have to do is take a group open air taxi, like a tuk tuk. The stop is at the other part of the main street that passes in front of the exit of Amphawa market. The price is 10 THB a person and depending on the traffic it will take about a half hour to reach Maeklong.